"Magar tum ek LADKI ho!!! (But you are a GIRL!!! 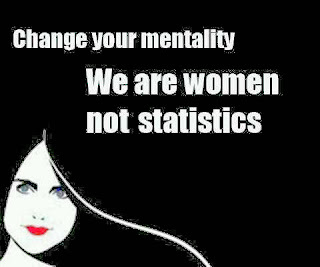 Being a girl/woman in today's age is a challenge. Smart Suraksha or Smart Protection is a MUST. It pays to be aware. 1. Trust your Instincts - Women have a keen sixth-sense. Try to exercise it more often. If you smell anything fishy, STAY AWAY. When my friends asked for 'lift' and boarded that car in Delhi a decade ago, they did even after sensing something amiss. But, once the car started racing, they realized that they should have trusted their instincts and not boarded it at all in the first place. 2. Use your Handbag & items in it as a Weapon - I feel an average Handbag or Purse is pretty heavy (mine is as I carry my World in it!) and can be employed as a weapon! Makes sense to carry items like Umbrella, Water-Bottle, sharp objects like screw-driver or Multi-Utility set like Swiss-Army Set consisting of knife etc that can be individually used to attack. 3. Handy to keep a Pepper Spray and Chilli Powder - Use these in case threatened. The sale of Pepper Spray has gone up considerably after the infamous Nirbhaya & Photo Journalist case... Let not it be a case of locking the stable after the horse is stolen. 5. Target the Attackers Weak Points - Eyes are the most sensitive areas of human-body that we can target when we are attacked. Even hitting the attacker on his groin will help. Using our strong elbows and knees should be helpful. Use your nails & teeth, if required. 6. Use Smart Sense & Tried & Tested Tips - Be smart, look confident and be alert. Attackers attack women who are busy, say on their mobile or not paying attention... If you are paying attention, at least later, you can help the Police with the description. This is an old trick that never fails- When confronted by attacker, Say - "LOOK WHO IS BEHIND YOU!" The attacker is sure to turn back! Then, you get some precious moments to RUN & MAKE A GET AWAY! Running away in a zigzag way, instead of a straight line, can confuse or tire the attacker! 7. Use Your Voice As A Weapon! Shouting or shrieking while simultaneously running to make a getaway should attract attention & hopefully get some Good Samaritans to help. 8. Keep Loved Ones Informed About Your Whereabouts & Try Not To Travel Alone & Especially Avoid When It's Dark or Deserted - Keep in touch more often e.g. while checking into a place, say coffee-shop, inform with whom you are there and where it is located. 9.Use Technology to the Optimum Advantage - Adopt a Smartphone & upgrade safety-status further. Be wise to use Chatting for your use to connect and keep loved ones informed. But, always make sure your phone's battery is optimally charged. Carry extra Portable Battery-Chargers that are available these days and can be a savior in case your phone has run out of charge...Using a post-paid mobile-connection is helpful as we can make unlimited calls. But, in case you have prepaid connection, please ensure sufficient balance in your cell. We must be forever ready with our Smartphone that can save our life. 10. Be Tech-Savvy & Smart & adopt Smart Apps like the Smart Suraksha App. 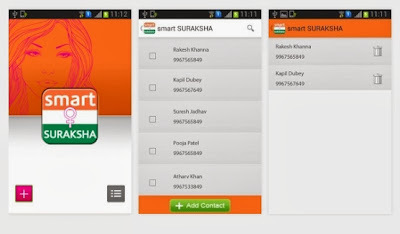 The Smart Suraksha App ensures that we are confident of our safety as well as aware of the safety of our loved ones. An additional feature of this app is that along with our message for help to our loved ones and Police, it also sends across our location even if the GPS on our cellphone is switched off. Thus, women can be reassured that there is help available at all times. All they need is to smartly download & use the Smart Apps. Prevention is always better than the cure. High time we adopt Safety Tips and be safe. I also shared SEEKING SMART SURAKSHA. Yup, its entirely up to us on how we deal with these situations... good points, every girl/woman should make a mental note of these..
Definitely, Seeta. It makes sense to be street-smart & wise to protect ourselves from the modern-day Duryodhans & Ravanas. Tips can be a life savior. Very nicely Compiled post Anita..I like the point of keeping plastic models of LIzards,and Pepper or Chilli Spray is must(I have presented one to my Girlfriend too). Thanks for your appreciation and wishes, Harsha! I have been travelling last month and have actually composed most of this Post at the Railway Station! On the day of the deadline, I was to board a train! My train, scheduled that night, was delayed by one and half hours while I was trying desperately to meet the deadline at the Station! Thanks for the extremely kind words, Uma! Means a lot to me! Great tips! Being confident is the most important one. Also, a woman should learn to look aggressive and not docile (whenever required). Yes, women with confident body-language, who are alert, have lower possibility of getting attacked. Prevention is better than the cure. Attackers target those who are busy fidgeting with purse or phone and are not really attentive... Looking 'docile' can act as negative as Attackers might feel they are easy-targets. But, then any one can get attacked even if confident, like the PhotoJournalist case in Mumbai. We have to be extremely careful. Thanks a lot Eli for stopping by, sharing your views & for your good wishes! Glad you liked my Post & found it useful. Please do follow the tips & be safe! Disha, Thanks for visiting & reading! Sprint Locator offers security check safety settings. This keeps parents informed about a kid’s arrival and when the kid attempts to leave from a predefined location, look at for more useful information! ALL IS WELL! I WON! JUBILEE POST FOR MY DOST!